I was just in a motor vehicle accident. An insurance company called. They want to talk to me about the accident. What should I do? I heard Massachusetts is a no-fault state. What does that mean? I was hurt in a car accident. Can I get monetary compensation for my pain and suffering? How about my mental suffering? Why should I choose The Law Office of Burns & Jain? Can I get compensated for my lost wages? Are you injured? If you haven’t seen a doctor already, do so immediately! Motor vehicle collisions may also cause injuries that you won’t feel until days later. Seeing a doctor after a car or motorcycle accident is important to your health and your recovery. Seeing a qualified doctor is also important to any potential injury claim or lawsuit. The doctor’s observations will help substantiate your case. So tell your doctor about all your injuries, and make follow-up appointments as per the doctor’s recommendations. Have someone report the accident to your car insurance agent. This may help you pay for immediate expenses like car repairs and replacement car rental and lost wages. Do not, however, give them a recorded statement without talking to an attorney first. Last but not least: If someone else’s negligence caused your car accident, please contact the Boston, Massachusetts car accident lawyers at The Law Office of Burns & Jain for a free personal injury consultation. The sooner you call us, the sooner we can begin investigating your accident and preparing your case. This will improve your chances of winning the maximum monetary compensation. I was just in a motor vehicle accident. Now what do I do? Call 911 if anyone’s been injured, if the other driver is drunk, or if there’s noticeable damage to a vehicle. Exchange information with the other driver – the driver’s name, address, phone number, driver’s license number, insurance company name, policy number, license plate number and state issued. If the other driver won’t give you this information, call the police. If the other driver tries to leave, take down the license plate number. Collect the names, addresses, and phone numbers of any witnesses. If someone won’t give you this information, take down that person’s license plate number. Take photographs of the damaged cars, any skid marks, and the surrounding area. Make a note of the time of day, the date, the weather at the time of the accident, and any other circumstances (for example, “heavy traffic” or “other driver failed to signal”) that you think might have played a role in the accident. If a paramedic offers medical assistance because you are injured, accept the offer. What should I not to do at the accident scene? Don’t admit that you were at fault. Don’t offer to pay for anyone else’s injuries. If you get a call from the other driver’s insurance company, do not say anything or sign anything before you talk to a lawyer. If you’ve already hired The Law Office of Burns and Jain, just tell the other driver’s insurance company to call Neil. Not every car accident requires getting lawyers involved. If you were in a “fender bender,” you may have little difficulty handling your insurance claim and vehicle repairs on your own. But if the motor vehicle accident was more serious, you and your family could be faced with life-altering injuries, huge medical bills, an extended loss of income, and ongoing rehabilitation. If you were in a car or motorcycle accident like that, we urge you to contact a lawyer: a lawyer with decades of experience, who has handled hundreds of cases much like your own; a lawyer you can trust to work aggressively and honestly to win you the best result possible; a lawyer like Neil Burns. Contact The Law Office of Burns and Jain in downtown Boston and ask for your free consultation. We will protect your rights, deal with the insurance companies, and fight to get you full monetary compensation. You heard right: Massachusetts is a no-fault auto insurance state. But if you were injured in a car accident, the no-fault rules will probably not prevent you from getting compensation for your injuries. No-fault insurance rules let everyone who was injured in a car accident – regardless of who was at fault – collect money (to pay for medical bills and lost wages) from their own insurance company. It is a way for people to be able to take care of immediate needs without first having to wait for a lawsuit to play out. 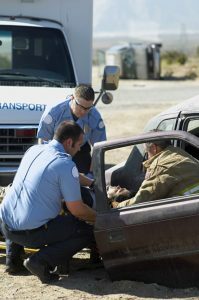 But if your injuries are severe enough, or your medical bills and lost earnings are more than $8,000 (or $2,000 if you have your own medical insurance), the no-fault rules will not stop you from suing the at-fault driver. The law regarding Personal Injury Protection or PIP is complicated. Also, motorcycle accident injuries are covered by different rules. If you were injured in a car accident, call The Law Office of Burns & Jain. Our attorneys can explain the no-fault rules more fully in your free initial consultation. Yes, if your injuries are severe enough. Your “reasonable and necessary” medical bills in connection with the accident are more than $2,000. You lost a body part. You were permanently and seriously disfigured. You became deaf or blind. If you’d like to read the original text of the law, click here. Massachusetts law allows you to get compensated for your lost earnings in three ways. First, there is PIP. Personal Injury Protection coverage is 75% of your lost wages. This comes form your own insurance carrier. It’s usually easy: we provide a copy of your doctor’s stay-out-of-work note and a copy of your employer’s assertion that you were out, and what your wages are, and you get a check. We normally do not take an attorney fee for this. Second, there is coverage from the defendant’s insurance company. This is that 25% that is not covered by PIP; it is also wages that are over and beyond the PIP coverage. Finally, there are future wages. Lost earning capacity in the future would require an expert economist to undertake a calculation for the insurance company or jury. It’s not too difficult to understand however: what is the present value of your future earnings? An experienced attorney will guide you through this process. Our best efforts – We will work our hardest and use all our experience and available resources to get you the best possible result. Aggressive representation – We will fight for your rights with zealous force and tireless persistence. Honest representation – We know how important your good name is to you – so we will always work on your behalf ethically and honestly. Negotiating from strength – We’ll prepare your case as though it’s going to trial. Most cases settle. But the only way to get the best settlement is to be fully ready for battle against the insurance companies. No “legalese” – We will speak clearly with you, use a minimum of jargon, and make sure you understand your case. Responsiveness – We will return your phone calls or emails within one day, unless there’s an emergency – and always as soon as possible. Give us a call at 617-227-7423 or request an appointment online. As always, your initial consultation is completely free of charge.